The aim of owning an e-commerce store is to sell merchandise. Unfortunately, many users abandon the idea of purchasing your products at the bottom of the funnel. However, lucky for you, there are strategies that can help you recover these lost shoppers, without using emails. You may ask yourself why we exclude emails solutions. As you can see, not everyone has professional emails techniques to solve the cart abandonment problem only with emails. Sometimes, it costs you a great deal of budget and time, which is not really necessary. 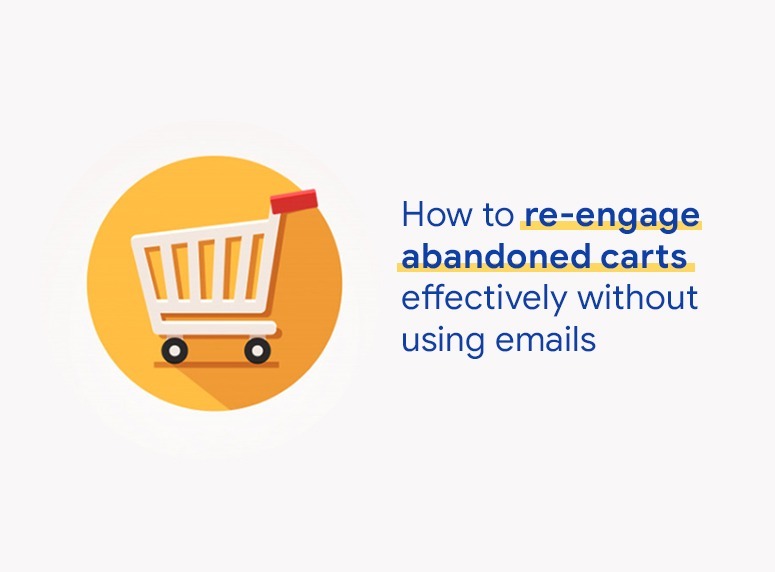 In this article, we will discuss strategies to re-engage users that abandoned their carts such as using targeted ads and creating a sense of urgency. Then, provide more valuable examples of top eCommerce players like Amazon and Target. Read on to find out how you can put the needs of your shoppers first to re-engage cart abandoners. These days, everyone uses exit-intent popups. Why? 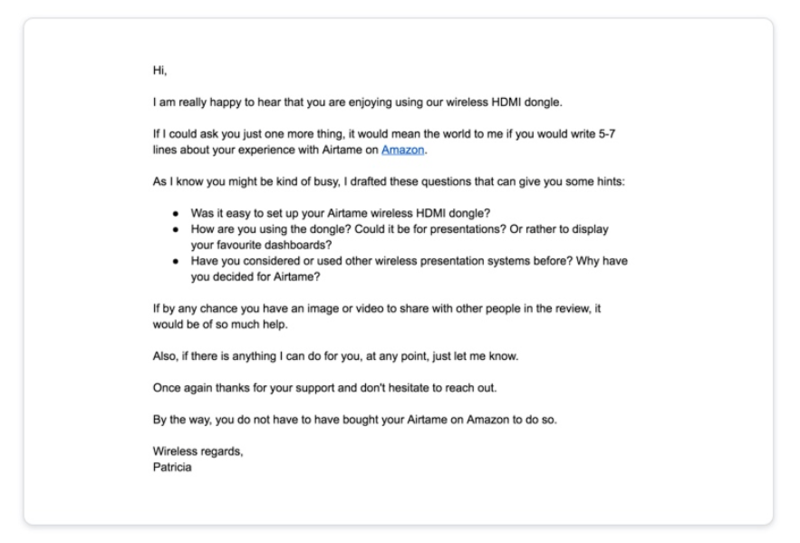 Because they’re an amazing way to re-engage customers. 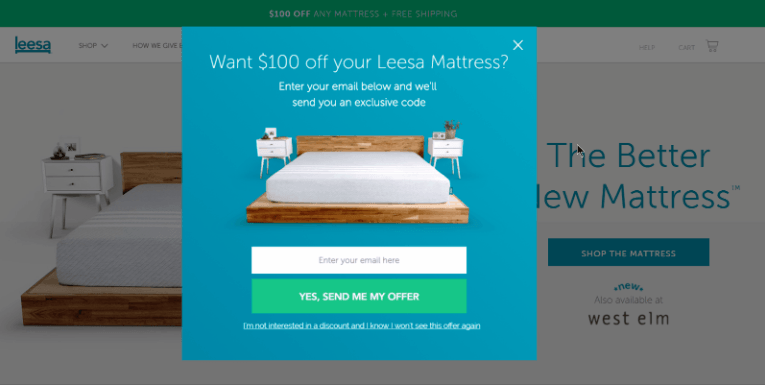 Most online retailers implement exit popups. They pop up on a website’s users screen just as they’re about to click away. What is its purpose? To have one last try at convincing them to make a purchase. For recover cart abandonment, you need to handle their objections. To do this, take a look at your analytics to find out why users are generally abandoning their carts. If it’s down to shipping costs, offer free shipping. Or simply the price of products, just give them coupons or discount code to increase their buying desire. If it’s because they’re still not sure about the product itself, use your exit popup to list the various ways your product will come in handy for them. 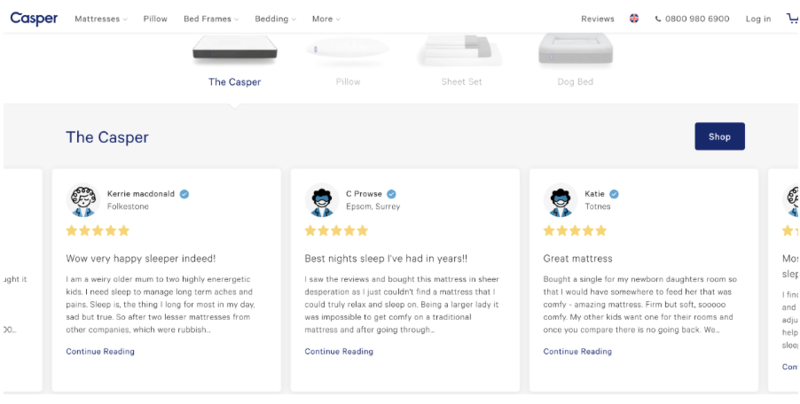 To illustrate, there is an impressive example of Lessa – a direct-to-consumer online mattress company dedicated to delivering American-made mattresses. We love this popup. First, because everyone loves a $100 discount. Then, because the popup style perfectly matches Leesa’s visual identity. A “price beat pledge” is a simple psychological trick that can be the difference between a customer abandoning their cart or completing the purchase. It offers them a sense of security. Make your price beat pledge clear, and be sure to list some of your competitors. Many companies have offered a price match pledge. AminoZ offers to beat the prices of any product by 10%. Some companies also offer price-match. This is also a great strategy if you are only able to lower the prices of your merchandise by a certain amount. The Bentonville, Ark., retailer says it is the low-price king. Its price policy states: “If you find a lower price from an online retailer on an identical, in-stock product, tell us and we’ll match it. Additionally, if you recently bought something from Walmart.com and it is now listed at a lower price, let us know.” It matches pricing at 30 online retailers, including Amazon, Chewy, Dollar General, Lowe’s, Target and Walgreens. Let’s turn your returns policy into a conversion machine. Customers have the fear that they can’t return an item. If a customer arrives at the cart and then realizes they won’t able to return their items if they’re unsuitable, there’s a high chance they’ll bail out. In fact, a quality returns policy also tells your customers that you’re confident in your products. It’s important for you to create a quality returns policy that helps you stand out from the crowd. The main point is you need to give your customers what they want. For example, according to research, 51% of consumers want free shipping returns. Also, make sure that your quality returns policy is clear, and consider offering multi-channel returning. Make sure it is accessible by placing it in the footer of your website. In fact, product reviews create trust and credibility, with statistics showing that 84% of us trust online reviews. Well, imagine it: A customer has put an item in their cart but then has second thoughts. “Does anyone else like it?” they ask themselves. They check for reviews and … nothing. Without product reviews, few people will trust your brand. If they’ve never heard of you, or they’ve never seen anybody raving about your products, why would they put their faith in your company? In order to get reviews, all you need to do is to reach out to your customers a few days after they’ve bought from you. Ask them if they’re happy with their purchase, and if they are would they like to leave a review? To increase the chances of receiving a review, provide a little help by giving direction. Just like in the email below. Another effective way to encourage customers reviewing your products is to use reward points. For example, you should have a policy that whenever a customer post reviews with a particular number of words with images, they would earn reward points or stars. Everybody loves reward points, right? How do you know what’s actually working and what isn’t if you don’t perform an A/B test? 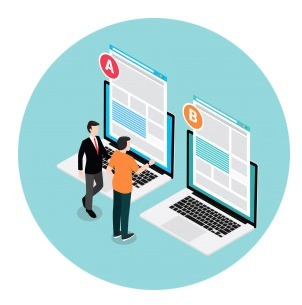 An A/B test is when you test two different versions of the same page to find out which one has a higher conversion rate. In this way, you can see if the change has had any effect on your abandoned cart rate. 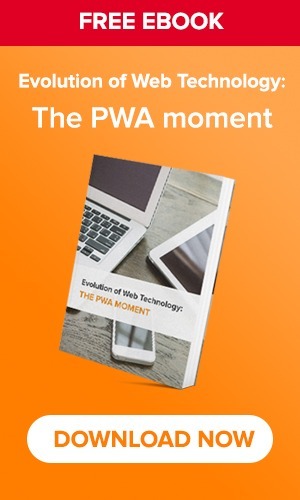 For instance, let’s test one version of your page that has the POS card reader as a payment option against a version of your page that doesn’t have the card reader as a payment option. Then see if adding the card reader has had a positive effect on your abandoned cart rates. To this end, you might find that offering different payment options, such as a POS card reader, reduces abandoned carts. One of the trustworthy methods that marketers use to motivate customers to complete a purchase is creating a sense of urgency. Another effective strategy is to let your customers know when a product is running out of stock. If you display that there are just “1 left in stock,” you’re creating a sense of scarcity that encourages people to act there and then. They don’t want to miss out. 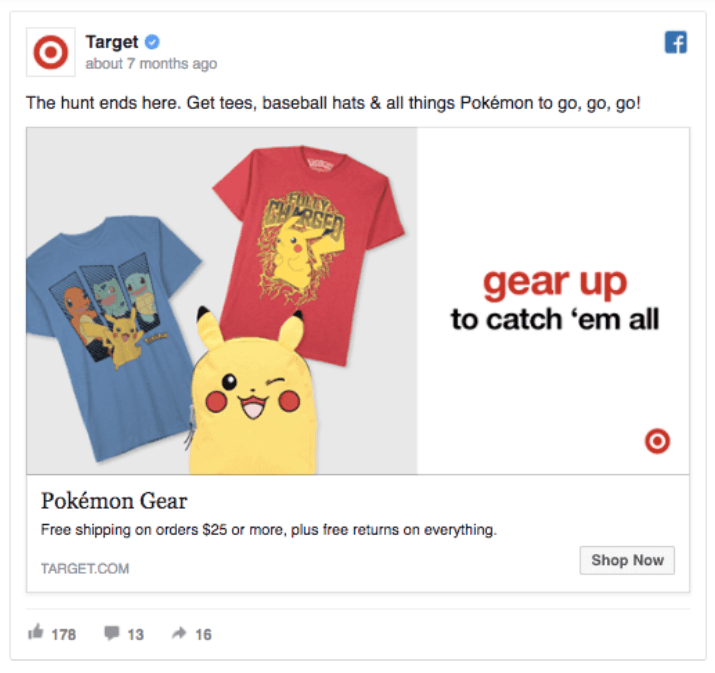 Targeted ads allow you to re-target lost shoppers. In more details, by using Facebook’s dynamic product ads, your cart abandoners will see the products they almost bought on Facebook and Instagram. There are various kinds of targeted ads you can create, and you should check your analytics to learn more about your customers and why they’ve abandoned their carts. One of the biggest reasons customers abandon their carts is unexpected shipping costs. Retarget prospects with ads that promise free shipping to bring them back. Why do you need to do this? Because several studies have shown that customers like to research online but buy offline. You’ll need your customer’s demographics for this strategy, and you should use geo-targeting to send customers to their nearest store. Who doesn’t like to get a coupon or a discount? The thing with a digital coupon is that you need to nail the copy so that prospects (potential customers) are engaged. There is an excellent use of the carousel ad format this time from eco baby brand Kit & Kin. 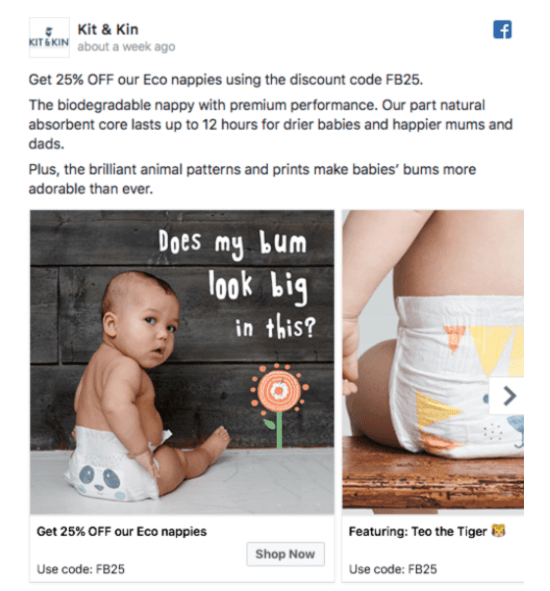 This re-targeting ad specifically promotes a 25% off discount on their Eco nappies to encourage the first purchase. Check out the example below. The copy is cute, direct and clear. The first line of copy makes it clear that this ad is for a promotion, specifically a 25% off discount deal. It also clearly states the discount code FB25 that someone needs to use to take advantage of the offer. After that, the second paragraph of copy states a feature of the product and goes on to describe the benefit to the buyer of this particular feature “drier babies for happier mums and dads”. The final line of copy highlights another product feature, the print on the nappies, and the aesthetic benefit to the buyer. The images in the carousel aren’t just of the product on its own as that would be boring. Instead, they’ve used lifestyle-based product images so the target audience can see what the product looks like when it’s being used. The first carousel title reiterates the offer in the ad, reminding the target audience that they can get 25% off. The cards that follow are all interconnected by referencing the characters of the animals printed on the product and utilize relevant emojis to stand out even more. The Shop Now CTA reminds the user that they are in a buying mindset and there is a discount to be had on the product. 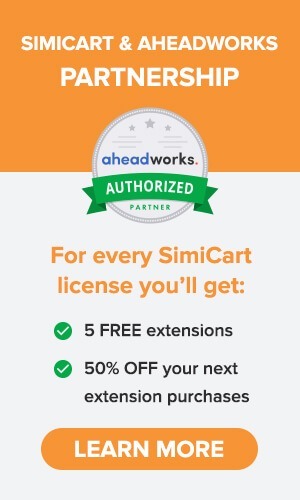 It’s also a good idea to add a touch of personalization to your digital coupon ads. Show your customers the item(s) they left in their carts, and show them other items they might like too (featuring). It’s this kind of personalization that builds trust. This is an advanced level of a product review. You should create targeted ads that show others using your product. Indeed, 70% of Americans shoppers say they’ll complete a purchase if they see it in user-generated content. In order to manage this tactic, you’ll need to contact satisfied customers and politely ask them if they’ll create a short video of them using your product. All in all, there’s always a reason why a customer abandons their cart. As long as you know it, you can take action to bring them back into the game.